Imam Ghulam Moyhuddin is a graduate of the Cambridge Muslim College where he studied under the guidance of Shaykh Abdal Hakim Murad and gained a diploma in Contextual Islamic Studies and Leadership in 2012. 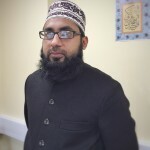 He is also a graduate of both Al-Azhar University and Cambridge University as part of a unique six month Intensive Interdisciplinary Advanced Imam Training Programme in 2010. Imam Ghulam Moyhuddin’s traditional Islamic education began at a young age when he completed his Hifz al-Qur’an and foundational Islamic Studies in Jamia al-Hanfia, Pakistan. Upon completing his A-levels he enrolled at Al-Fajr Institute in Cairo and at Al-Azhar University for two years to study the Arabic Language, Islamic History, and Hadith. He also then completed his traditional Dars-e-Nizami from Jamia al-Karam, Retford under the care and tutelage of Shaykh Muhammad Imdad Hussain Pirzada. 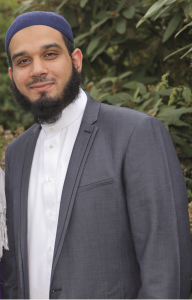 After 7 years of seminary and higher education he is currently the Head Imam of Ashton Central Mosque in Ashton under Lyne, teaching a myriad of Islamic subjects as well as designing an Islamic education curriculum. He strongly believes in the contextual application of Islamic sciences to develop and engrained an indigenous British Islamic identity. A member of the Al-Karam Scholars Association, alumni of the World Association of Al-Azhar Graduates and the Cambridge Muslim College, his special interests include teaching theology, Qur’anic exegesis, and contextual Islamic Studies. Imam Zahid is the second Imam at the Ashton Central Mosque catering for all the Urdu speakers. Endowed with a melodious voice, he specialises in the beautiful recitation of the Qur’an and Nasheeds. Every Jumu’ah begins with his beautiful recitation between 10-15 minutes which raises the soul and brings tranquility to the heart, be sure to attend early each Jumu’ah. Imam Zahid Sharif hold an M.A. Aalmia degree from Islamic University of Jamia Nazamia Razvia Lahore as well as a B.A (Aalia Degree) from Tanzeem Ul Madaras (Ahle Sunnah) Pakistan. Imam Zahid Sharif leads weekly Adult Islamic Studies Circles every Monday in which all locals are welcome to earn, correct and enhance their knowledge of Islam. He also delivers profound lectures on the commentary of the Qur’an every Thursday followed by Zikr session.